Children on immunosuppressive therapy for cancer or organ transplantation are very similar to those with primary immunodeficiency in that all are highly predisposed to infection with all types of pathogens—ie, bacteria, viruses, fungi, and parasites—and are highly likely to experience the reactivation of microbial agents, particularly viruses, while they are immunosuppressed. For this reason, early recognition and treatment are critical for optimal chances of survival and minimal morbidity. The selection of initial empiric therapy for these patients when febrile is based on the type of immune suppression (eg, neutropenia and cellular immunity) and other predisposing factors such as the presence of central venous lines (CVLs). Much of our clinical approach to prophylactic and definitive antimicrobial therapy for children with cancer and suspected infection comes from our experiences in managing children with primary immunodeficiency. For this reason, the present review examines aspects of management of all patients with primary or acquired immunodeficiency. Consistent infections in all of these patients include bacteremia in those with CVLs, Pneumocystis jirovecii pneumonia, primary and reactivation infection with herpes group viruses, and opportunistic fungi. Some infections in well-defined groups of immunosuppressed hosts are frequent enough to warrant prophylactic therapy; in most cases, the duration of such therapy is well defined. Excessive continuation is likely to lead to colonization and infection with antibiotic-resistant organisms. When antimicrobial therapy is used for defined infections, the use of the highest dosages considered safe and longer durations are warranted. Oncology patients, both children and adults, have a very high incidence of infection, resulting from the immunodeficiency that is iatrogenically introduced during their management (Table 1).1,2 This circumstance is an unavoidable consequence of advances in cancer treatment that have resulted in greatly increased survival and overall cure. Chemotherapeutic regimens for cancer patients, directed at inhibiting tumor replication, are toxic to all elements in bone marrow, including immunologically competent white blood cells. In addition, patients with a variety of diseases are kept alive for longer periods of time using extraordinary supportive measures that offer a much greater chance for eventual colonization with multiresistant or unusual microorganisms as well as eventual overt infectious disease. The infectious agents that cause such infections are often opportunistic organisms. For each medical intervention in these fragile patients, the physician must calculate risk-benefit factors and anticipate adverse events.3 Some common complications involve local factors related to diagnostic or therapeutic procedures and to the placement of indwelling catheters, cannulae, or other foreign bodies. Such factors set the stage for colonization with opportunistic pathogens, which may then account for significant morbidity and mortality. Most patients with diseases that result in secondary immunodeficiency receive blood or blood products during the course of their therapy. The transmission of infectious diseases to these patients represents a significant risk, particularly for patients who receive multiple transfusions (Table 2).4 Potential blood donors are not screened for many of these agents. Hepatitis is the best-understood and most carefully monitored disease, whereas recent literature5 incriminates cytomegalovirus as an agent that is increasingly likely to cause severe illness. Blood donors are often asymptomatic for infectious agents at the time of phlebotomy. When the recipient of blood products is immunocompromised, additional care should be taken in screening donors and providing follow-up medical examination of donors as a routine aspect of the recipient's care. Additional problems of transfusion therapy are pulmonary edema from volume overload, hemolytic reactions, and other incompletely understood febrile reactions. Determining the incidence of primary immunodeficiency syndromes is difficult because many of the more severe forms may result in early infant death before a diagnosis. One British study estimated that 1 in 50 child deaths was a result of immune dysfunction.6 Realistically, primary care physicians only occasionally encounter the more severe defects. More common deficiencies, such as transient hypogammaglobulinemia of infancy and selective immunoglobulin A (IgA) deficiency, are familiar to clinicians. Most primary immunodeficiency syndromes present during infancy or early childhood, with the most notable exceptions being common variable hypogammaglobulinemia, cyclic neutropenia, and complement deficiencies that may not become clinically apparent until later in life. The deficiencies of the latter components of complement components 5-8 are not seen until adolescence or early adulthood with the presentation of recurrent meningococcal and gonococcal disease. Immunodeficiency syndromes and their usual age at diagnosis are summarized in Table 3. The approach to therapy varies according to the specific defects demonstrated (Table 4). The most difficult deficiencies to manage are those with T lymphocyte or combined T and B lymphocyte abnormality, for which bone marrow transplantation usually represents definitive therapy. Selective B lymphocyte deficiencies with hypogammaglobulinemia are treated with immunoglobulin replacement and are best managed by primary care physicians. Intravenous preparations of human serum Ig are readily available for therapy, generally given at a dosage of 400 mg/kg monthly. These treatments should be used only for patients with documented hypogammaglobulinemia accompanied by recurrent clinical infection or with demonstrated inability to produce specific antibodies following antigenic challenge (eg, tetanus). The physiologic hypogammaglobulinemia, apparent at 3-6 months of age, does not require supplemental Ig and must be distinguished from the transient hypogammaglobulinemia seen in infancy. The latter deficiency represents a delay in normal antibody synthesis after maternal IgG is no longer at protective levels; these infants occasionally require Ig supplementation until approximately 18 months of age. Defects in neutrophil function must be followed closely and treated with antibiotics, especially during acute infectious episodes. Thus, close communication between patient or parent and physician becomes the most important aspect of management. The suppression of immunologic function with resulting increased susceptibility to infection may result from a number of primary diseases (Table 5). This circumstance is more common in adults than in children because of the higher incidence of malignancy and the greater use of immunosuppressive chemotherapy for a variety of diseases. Acquired immunodeficiency syndrome is the most common predisposing factor in children. More than 2% of all hospitalized children demonstrate secondary immunodeficiency.6 Recognition and treatment of these host defense abnormalities have therefore become a very important aspect of hospital practice. Secondary deficiency is actually much more common than primary immunologic disorders, even in infants and children, and is usually managed by primary care physicians with consultative support. The recognition of associations between specific infectious processes and primary disease offers important guidance to diagnosis and treatment (Table 6). All of these should be well understood by physicians caring for pediatric patients. Congenital neutropenias may present either in childhood or during the adult years and include benign neutropenia and variants thereof, cyclic neutropenia, and infantile genetic agranulocytosis.7 These syndromes are secondary to the inadequate production of granulocytes. Although a large spectrum of clinical consequences has been described, most patients do not experience a significantly increased propensity for infection. Inadequate production of neutrophil precursors may also be a consequence of nutritional deficiencies, including vitamin B12 and folate, or secondary to infectious processes such as typhoid fever, infectious mononucleosis, and viral hepatitis. More common than congenital neutropenias are neutropenic states secondary to the use of cytotoxic drugs in cancer therapy, autoimmune disease, and the excessive destruction of granulocytes (either as inherited disorders, because of hypersplenism, or a result of artificial heart valves or hemodialysis). More recently described7 is an autoimmune process in which antibodies, directed at neutrophils, produce profound neutropenia. These autoantibodies are often seen in conjunction with autoimmune states such as lupus erythematosus and Felty syndrome. In such cases, infectious diseases are difficult to manage and account for observed high mortality. Granulocyte transfusions are of no benefit because antineutrophil antibodies destroy donor cells. The clinical approach for patients with neutropenia secondary to immunosuppressive chemotherapy consists of careful monitoring for infectious episodes and early institution of antimicrobial therapy. Once acute infection is documented, these patients must be treated for longer periods because eradicating bacteria without the help of the host's granulocyte killing capacity is extremely difficult. Normal neutrophil counts are generally in the range of 2,000-5,000/mm3, with variations by age, gender, and race. Although neutropenia is defined as an absolute neutrophil count of <1,500/mm3, increased infection is not observed until a neutrophil count is <1,000/mm3. The absolute neutrophil count is an important objective parameter for making clinical decisions about immunosuppressed patients with fever (Table 7). Offering antibiotics to febrile patients with a neutrophil count of <500/mm3 pending results of culture has become a fairly standard protocol. The best indicator of susceptibility to systemic bacterial disease is the absolute neutrophil count. A count of <500/mm3 in a febrile patient dictates empiric antimicrobial therapy10 (Table 9). If therapy is not instituted and blood cultures are obtained daily for 5 days, 50%-80% will eventually demonstrate bacteremia. If antibiotics are not started until a positive culture is obtained, mortality is more than 80%. Diagnostic evaluation should include cultures of blood, urine, and any other areas of suspicion, with chest x-ray and lumbar puncture to be performed if central nervous system infection cannot be ruled out clinically. Baseline liver enzymes, renal function studies, and serum electrolytes should also be obtained prior to beginning antimicrobial therapy. The selection of antibiotics must obviously provide coverage for the most likely pathogens, yet be particularly directed at the most difficult-to-treat organisms. In most settings, Pseudomonas aeruginosa represents the most resistant potential organism. Presently no clinical evidence demonstrates that one particular combination from the list in Table 9 is more efficacious than another. Monotherapy is preferred unless Staphylococcus aureus is a major consideration. Finally, the duration of recommended therapy is different from that for routine infections; treatment courses depend on the period of fever and granulocytopenia. If a patient shows a return of peripheral neutrophils after 3 days of therapy, then intravenous antibiotics could be discontinued and treatment changed to oral therapy, particularly if cultures are negative and the patient is afebrile. On the other hand, if fever and granulocytopenia persist, antibiotics are usually continued even after what would normally be considered adequate therapy (Table 11). The recovery of Candida sp. from the blood of immunosuppressed patients has become commonplace and usually results from 2 predisposing factors: long-term, broad-spectrum antibiotics and the presence of intravascular access lines. In almost all cases, medically placed catheters or other offending foreign bodies should be removed to help eradicate this fungus. Limiting the number of broad-spectrum antimicrobial agents used must also be considered. Table 12 summarizes the management of candidemia. Fluconazole or liposomal amphotericin B, in relatively low doses and of short duration, is usually effective in treating this infection. In the immunologically normal host with candidemia, the removal of the intravascular line is often the only necessary step. Some infections in a well-defined group of immunosuppressed hosts are frequent enough to warrant prophylactic therapy (Table 13). Transient defects in cell-mediated immunity are commonly encountered during the course of acute or chronic illnesses (Table 14). For a variable period of time, patients may fail to demonstrate positive delayed hypersensitivity to intradermal skin testing.13 This lack of reaction presents an enigma to clinicians using a skin test to diagnose a patient's primary illness. To differentiate global cutaneous anergy, a battery of skin tests might be applied along with the test antigen. A positive skin test to a recall antigen such as tetanus or candida along with a negative skin test to the pathogen in question would reassure the physician that this patient can respond to specific antigens, allowing the physician to interpret the negative specific skin test as evidence against disease. However, this reactivity is not absolute—particularly when skin testing for tuberculosis—because antigen-specific nonreactivity has been observed. The phytohemagglutination (PHA) skin test is probably the most sensitive test for evaluating anergy; the question of infection would be more rapidly resolved with this mitogen in the initial skin test battery. Placing other skin tests first would create a delay of 2 days while reading these tests before the PHA skin test can be applied as a second step in the diagnostic work-up. Physicians should monitor patients with diseases known to be associated with cellular immunodeficiency and be alert that such patients are highly predisposed to viral and fungal infectious processes. The degree of cellular immunosuppression can be roughly determined by quantitating T lymphocyte CD4 subpopulations. This testing for clinical management helps direct early and aggressive use of antifungal or antituberculous medication for severely immunosuppressed individuals, often prior to receiving final culture results. With the use of a staging system (Table 15), patients can be categorized into those who have mild suppression of cellular immunity and those who are severely immunosuppressed. The latter group of patients is at extremely high risk of infection with opportunistic pathogens, particularly fungi and herpes group viruses. Patients who have recently undergone transplantation, either bone marrow or solid organs, represent a population with moderate to severe immunodeficiency and a high risk for opportunistic infections. Many infections are caused by reactivated pathogens present in the host or donor organs at the time of transplant. 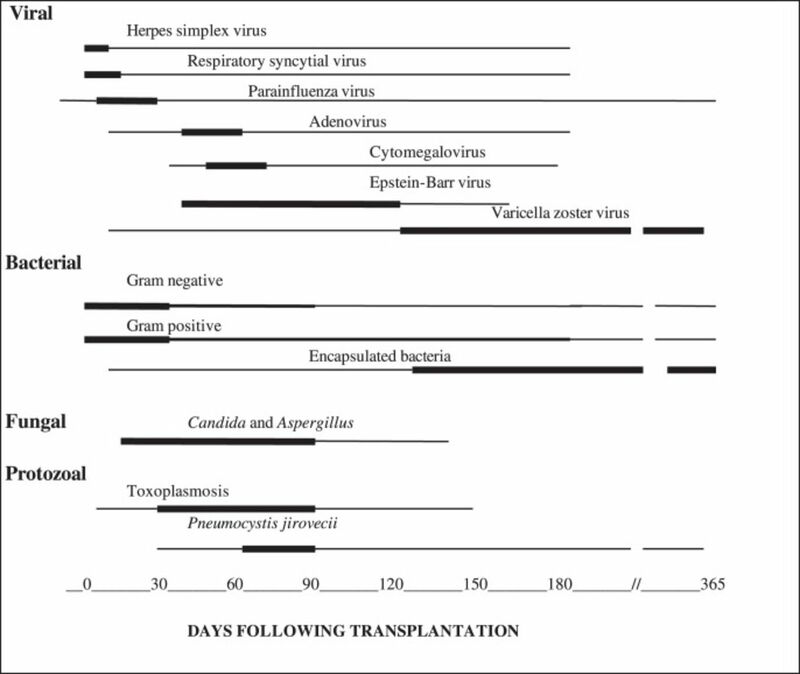 Etiology varies with timing before or after transplantation and is consistent enough to use timing in relation to transplant in the initial approach to a differential diagnosis (Figure).5 The reactivation of herpes group viruses, particularly cytomegalovirus, is so common in these patients that obtaining serologic data prior to transplant to determine previous infection with these potential pathogens for both recipient and donor is critical. Prophylactic antiviral and antibacterial therapy is often warranted. Timetable for infection following transplantation. Infection in immunocompromised patients offers a particular clinical challenge because the pathogens are often unusual, and appropriate treatment must begin early in the course of the illness. These patients also must receive the highest tolerated dosages of antimicrobial agents and for maximum durations. Prophylactic antibiotics should also be given based on the pathogens likely to reactivate during the time of more severe immunosuppression. (2, 1999) Suppressed neutrophil function as a risk factor for severe infection after cytotoxic chemotherapy in patients with acute nonlymphocytic leukemia. Ann Hematol 78(2):73–77, pmid:10089021. (4 1, 2005) Infections in patients with febrile neutropenia: epidemiology, microbiology, and risk stratification. Clin Infect Dis 40(Suppl 4):S240–S245, pmid:15768329. (8, 2000) The Multinational Association for Supportive Care in Cancer risk index: a multinational scoring system for identifying low-risk febrile neutropenic cancer patients. J Clin Oncol 18(16):3038–3051, pmid:10944139. (12, 2001) Transfusion-transmitted bacterial infection in the United States, 1998 through 2000. Transfusion 41(12):1493–1499, pmid:11778062. (12 20, 2007) Infection in solid-organ transplant recipients. N Engl J Med 357(25):2601–2614, pmid:18094380. (5, 2005) American Academy of Allergy, Asthma and Immunology; American College of Allergy, Asthma and Immunology; Joint Council of Allergy, Asthma and Immunology. Practice parameter for the diagnosis and management of primary immunodeficiency. Ann Allergy Asthma Immunol 94((5 Suppl 1)):S1–S63, pmid:15945566, Erratum in: Ann Allergy Asthma Immunol. 2006 Mar;96(3):504. (6, 1996) Non-malignant neutropenia. Blood Rev 10(2):95–100, pmid:8813341. (9, 1997) Renewed interest in granulocyte transfusion therapy. Br J Haematol 98(3):497–501, pmid:9332301. (4 1, 2005) Challenges in the treatment of infections caused by gram-positive and gram-negative bacteria in patients with cancer and neutropenia. Clin Infect Dis 40(Suppl 4):S246–S252, pmid:15768330. (2 15, 2011) Clinical practice guideline for the use of antimicrobial agents in neutropenic patients with cancer: 2010 Update by the Infectious Diseases Society of America. Clin Infect Dis 52(4):427–431, pmid:21205990, Epub 2011 Jan 4. (2002) Empirical oral antibiotic therapy for low risk febrile cancer patients with neutropenia. Cancer Invest 20(3):420–433, pmid:12025236. (9 1, 2006) Outpatient oral antibiotics for febrile neutropenic cancer patients using a score predictive for complications. J Clin Oncol 24(25):4129–4134, pmid:16943529. (11, 1976) Screening for cell-mediated immunity in children. Am J Dis Child 130(11):1218–1221, pmid:984003.